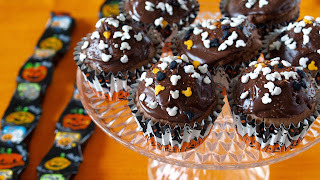 Easy and light chocolate cupcakes with no butter! I used Cadbury Old Gold Original which I bought in Australia. 1. Place the chocolate (broken into pieces) in a bowl. Melt the chocolate in a double boiler over hot water (60C/140F). Leave to cool slightly but not harden. 5. Then add the chocolate (1.) and mix well with a wire whisk. 6. Sift in flour and baking powder. Gently mix with a wire whisk or a spatula until combined. 7. Preheat the oven to 180C (350F). 8. Spoon the mixture into the cups up to 80% full. Bake at 180C (350F) for 20-25 minutes. 9. Place the cakes on a wire rack to cool completely. 2. Spread the chocolate on top of the cupcakes using a spoon. Then finish with sprinkles of your choice.